A HIGH speed 1 hour Jet ski adventure. Enjoy the sights and sound on this action packed thrill ride as you pass next to Star Island and the homes of the rich and famous. Stop on Monument island and enjoy miami like a native!!! 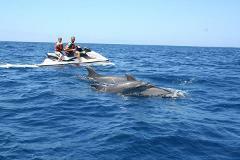 Jet Ski Rental in a designated ride zone and enjoy making your own waves!! A "Once in a Lifetime" adventure. Enjoy the sights and sounds of the Bahamas on this action packed thrill ride as you spend a weekend on one of the most memorable places on earth Bimini Island, Bahamas.